Daikokuten is the ancient Indian god called “Mahakala“ in Sanskrit, who took charge of battles, destruction and the like. In esoteric Buddhism,　it is considered to be “Makesvara“ incarnate that is the guardian god. In Japan, Daikokuten has been one of the Sichihukujin-seven gods that bring us good luck. Also in Shintoism, which is the indigenous religion of Japan, Daikokuten has been the Japanese god“ Ohkuninusi“ together and has been enshrined. 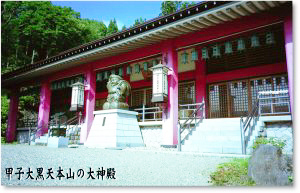 This genealogy brought the factors of esoteric Buddhism and ascetic Buddhism to the faith in Daikokuten. People imagine that Daikokuten has a small mallet in his right hand, carries a large sack on his left shoulder, and wears a hood. He is usuallyseen treading on a straw bag and he is usually laughing. In present day Japan, We can still see figures of Daikokuten.